Even during the ancient Babylonian days they also do have this problem. In George Clason's 'The Richest Man in Babylon', it described how those who know how to accumulate Gold succeed while the rest are mere laborers. To find the answer to the puzzle on why ordinary citizens don't know how to accumulate Gold, King Sargon summoned Arkad, who is the richest man at that time and accumulated the most Gold. Arkad disclosed to the King on how he managed to accumulate so much gold through 'Seven cures for a Lean Purse'. The following are the prescribed Seven cures for a lean purse. The above are the classic guide on how to be Financially Independent. It has been proven to this day after more than a few thousand years in existence. The question is how can we measure Income Inequality? Fortunately it can be measured by using a statistical approach known as the Gini Coefficient. The Gini Coefficient was developed by a statistician named Corrado Gini, and it is a measure of the income distribution of the population in a country. It range between 0 and 1 with 0 being in perfect equal and 1 being highly unequal. It helped define the gap between the rich and poor nations. The income distribution of a nation can also be represented graphically with the Lorenz curve below. The upward sloping 45 degrees line represents the equal distribution of wealth. An example will be the intersection point of the 20% of the income distributed and the 20% of the population. On the y-axis (vertical) you have the income distribution as expressed in decimals and on the x-axis you have the wealth of the nation. The area that is shaded in red represents the ‘area of inequality’ in income distribution. So the flatter the Lorenz curve the bigger will be the ‘area of inequality’ and hence the income distribution. An example of unequal distribution is where the 11% of income intersects with the 40% of the population on the Lorenz curve. This shows that 11% of the income is distributed to 40% of the population. How Malaysia compared to the rest? Anyway as of 2009 Malaysia is ranked 102 out of 136 countries surveyed by the CIA for the most unequal income distribution and placing it within the vicinity of Sub Saharan and African countries. The following is the income distribution of different ethnic in Malaysia and also its Gini coefficient from 1995 till 2009. According to World Bank, Malaysia was one of the few East Asian countries that reverse its income inequalities over the past decades but unfortunately reverses its direction since the 1990s. In other words policies drafted by policy makers since then are not effective. This may be due to the bias policies that are drafted to the benefit of the ‘Bumiputra’ community while neglecting others and also the emergence of a new ‘ruling class’ that are make up of political cronies. This new group are given special treatments and are encouraged by the ‘powers to be’ to gobble up much of the nations strategic and big businesses in order to make up what is known as the ’30 percent Bumiputra quota’. Needless to say the end result is the re-emergence of the old Colonial type of ‘Rent Seeking’, businesses where being the monopoly or duopoly is the order of the day. As we know being in a position to monopolize any sector of the economy will only resulted in being contented. No incentive for being innovative and competitive made these conglomerates being redundant and badly managed and in the end left to decay. Some of the remnants of those failed conglomerates that include MAS, PERWAJA STEEL, PROTON and Bank Bumiputra just to name a few. High inequality in income will have negative effects on economic growth. 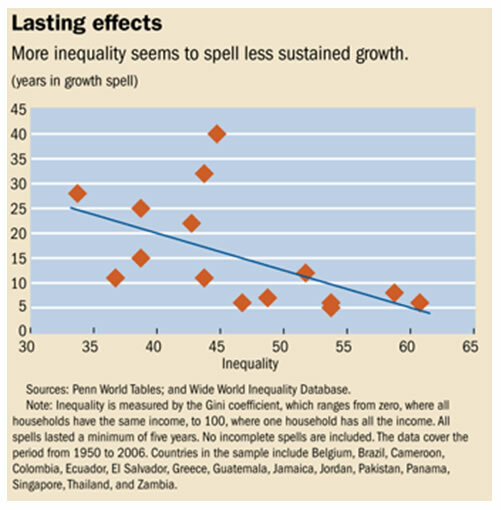 One study done by economist Andrew Berg and Jonathan Ostry of the IMF recently found that the countries with higher inequality of income tends to have a shorter spell of economic growth than those that with more equality. Getting the economic growth going is easier than maintaining or sustaining it. This is because there are many economic policy tools that can start an economic growth like embarking on a loose monetary policy and expansionary fiscal policy. However maintaining a sustainable economic growth for a certain time period say 10 years is a task not to be taken lightly because after a certain time period certain economic policies tend to run its course and boom will be followed by bust. To maintain the level of exports in an export oriented economy during economic downturns, policy makers normally will have to devalue their currencies against their competitors or reduce the interest rates in the domestic banking sector. The problem is how much interest rate can you reduce? Even economies like Japan and the U.S that are running close to ZIRP (Zero Interest Rate Policy) but yet still failed to increase its exports and turnaround their economies. In the case of Japan, it is worse off as its economy went into a tailspin and pushed its economy into a deflation mode. Coming back to the IMF study, they found that in order to reduce income inequality by a certain percentile say 10% then the number of years of sustainable economic growth will have to be doubled. It can be shown by the following graph. The Vertical axis is the number of years of sustain growth and the horizontal axis is the Gini Coefficient. As you can see if you want to reduce the Gini coefficient from 48 to 44 you have to increase the years of sustainable economic growth from 5 to 10 years. So if a country have a high Gini coefficient then it is very difficult for it to reduce its income inequality because it need a prolong sustainable economic growth. This can explain why Malaysia’s income inequality remains high throughout the last 20 years because it is very difficult to maintain a high economic growth rate for many years. Moreover its economy had been experiencing a few boom and bust cycles for the past decades. Due to income inequality the wealth of the nation will be concentrated to a few individuals which constitute the top 1% of the population. As a result more people are forced to borrow more and more to meet ends need. With the top 1% controlling most of the country’s wealth it is no surprise to see the mean income remained low or unchanged for the past decades. As a result since most of the population are in the lower end of the income spectrum it will be difficult to see any increase in spending to uplift the economic activity that is needed to drive economic growth. A good example will be the amount of wealth held by some of the political cronies such as Syed Mokhtar. He is the favored crony of UMNO (United Malay National Organization) party and is said to have his hands into almost every major business in the country. He controlled a few public listed companies such as Tradewinds, MMC, Bernas and etc in the KLSE. Through many Mergers and Acquisitions with Proton (the National Car) being the latest addition to his stable of companies, he managed to accumulate debts to the tune of RM34 billion. It is said that his borrowings are equaled to 10% of all loans that are made by all banks in Malaysia. However, it is only backed by about RM 7.8 billion in cash and assets. To find out we shall use the following formula. As for the gearing ratio, anything above 3 is considered high and 4.35 is what I called ‘Highly Geared’. It is quite impossible to maintain such high gearing during trying economic times like now. Any further downturn in the economy will cut into the operating profits and will severely affects his group of companies cash flows. In addition he will also need cash to service his debts regardless of how bad the company is doing. The end result will be another bailout by the government and we will see a rerun of the 1998 Asian Financial Crisis saga where the government bailout many of its political cronies business empires. This will represent another attempt by the Government to use taxpayer’s money to artificially prop up uncompetitive companies. It is another classic case of throwing good money after bad money. A good example will be Halim Saad’s Renong Group of Companies which is a diversified conglomerate that is worth to the tune of more than RM 20 billion. Although initially being bailed out by the government however eventually it still failed to survive the crisis. In view of the impending collapse of the Syed Mokhtar’s empire, how can we take advantage of the situation? How to trade the Syed Mokhtar Put? There are two possibilities whereby it can cause the collapse of the Syed Mokhtar Group of Companies. One, it is the expected defeat of the current ruling coalition or Barisan Nasional (National Front) in the soon to be held election this year. Two, it will be the current ongoing global financial crisis. With such high gearing you don’t even need the collapse of the Global Financial Crisis to push it over the cliff. It will collapse eventually because most of his businesses are not ‘cash rich’ and recession proof in nature unlike a casino. Other than rice distribution and toll operations, his other businesses in ports, car manufacturing, hotels, manufacturing and etc are not only ‘cyclical in nature’ but also ‘capital intensive’ and will be influenced by the ups and downs of the global economy. So when either of them happens then we shall do the ‘Syed Mokhtar Put’. Firstly, you need to sell off your stocks in the KLSE and then load up the short contracts on KLCI futures in KLOFFE. In other words you perform a short selling on the KLCI futures. Secondly, you can buy a put option on the KLCI. A word of caution though because such maneuver is only for those in the know or those who have traded futures before. If you have no experience in the Futures or Options market then we suggest the best strategy is to cash out and wait for the downturn to run its course and this may take 6 months to 2 years depending on how severe is the downturn. After that then you load up on the stocks. It will create what we called the ‘Elites’ which belongs to the 1% and ‘the rest’ and there will be tensions among them. The Government will find it difficult to get the support of ‘the rest’ group to follow its policies such as to promote savings or spending because they afraid in the end it only benefits the ‘Elites’. A good example is the Government’s recent launch of its recent Bon Malaysia which pays a 5% yield. Although it pays higher than the commercial bank’s term deposit rate of about 3.2% on average but it is still under subscribed because the population believed that the funds raised will be channeled to unproductive ventures like bailing out crony companies, coming election campaign funds, paying for subsidies and etc. Another unintended consequence arising from this class warfare is ‘distrust’ of the lower income group in the Government’s effort to reduce income inequalities either through taxation or salary redistribution (minimum salary). For any income redistribution system to work, the government must ensure that those people enlisted to such responsibility should be competent, trustworthy and transparent in their process. If this can be accomplish then people will not mind policy makers taking a portion of their money through taxes for the greater good and in this case a rebalancing of the income inequality in the society. If not then people will be less willing to part with some of their money by under declaring their taxable income. Due to the big disparity in the income distribution needless to say those belong to the lower rung in the income distribution table can least afford better healthcare. Those who belong to the top 5% in the income distribution can afford better private healthcare and hence life expectancy. By relying on public healthcare it will further burden the government by allocating more funds to build more hospitals, employ more nurses and doctors and hence less funds can be diverted to other development projects. With Malaysia’s high Debt to GDP of about 53.5% in 2011, it will be a difficult task for it to reduce its debt because the growth of debt will always be faster than economic growth. Why is this so? This is because Debt servicing in the form of interest rate grows exponentially through what we called ‘compound interest’ while economic growth only grows organically due to the boom and bust cycles. Economic growth can be likened to the shape of the Sine Wave or S curve below. 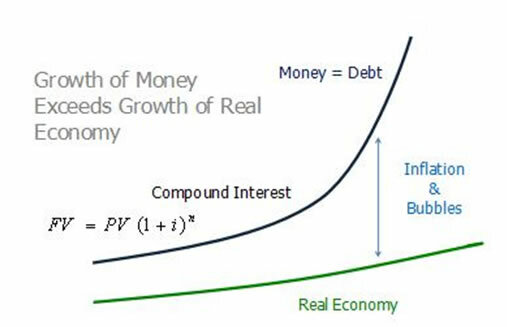 The following graph depicts the difference between the growth of Money or Debt versus the growth of the real economy. As can be seen from the above, once the growth between compound interest and the real economy (GDP) starts to diverge then the gap between them will start to widen. This implies that once our Government’s debt reaches a certain level to GDP then its ability to pay back its debt will very difficult if not impossible. From empirical evidence in the last few years from the ongoing financial crisis in Europe, whenever a country’s Debt/GDP reaches above the 70% threshold then there is a very high probability that its economy will go into a tailspin in the next few years. This is because once the Debt/GDP ratio increases it will decreases the country’s ability to service its debt because more money will be needed to repay its interest and hence less will be directed towards the real economy that will help generate more income. Moreover when a country’s Debt/GDP ratio increases, its Sovereign ratings risk being further downgrade by Ratings Agencies. Whenever a country’s Sovereign ratings being downgraded then its ability to raise funds in the international market will be dampen because its cost of funds has increased. Bond holders will need to be compensated for holding the higher risked Sovereign Bonds now and hence the yield (interest rate) will be higher. With Malaysia’s Debt/GDP being 53.5% and without any real effort to address this problem, it will soon shoot up to the 70% threshold. If left unchecked then in a few years time Malaysia will be heading towards the path taken by Ireland, Greece, Portugal, Spain and the soon to join the club Italy. Again another key area that the government needs to do is to gain the Trust of its people. Since most of the government revenues are raised from taxes and if it wants to collect more then it will need to give them the assurance that the money will be spend wisely and on projects that will further improve their life in the future. A corrupted government like Malaysia will find it tougher to achieve such a goal because it first needs to overhaul its political system to make it more transparent in order to win the trust of its people. Further increases in taxes will be countered with more revolts as people felt more burdened by increase in their cost of living.